JEE Main Counselling Registration 2018: Joint Entrance Exam (JEE) is entrance exam conducted for getting admission in engineering & architecture colleges in India. This exam is organized by Central Board of Secondary Education (CBSE). It has been formed by two separate examinations JEE Main and JEE Advanced. JEE Main 2018 was held on 8 April and has announced the result on 30 April. Candidates who cleared the JEE main cutoff will be called for counselling process. JEE Main Counselling is going to start from 15 June. 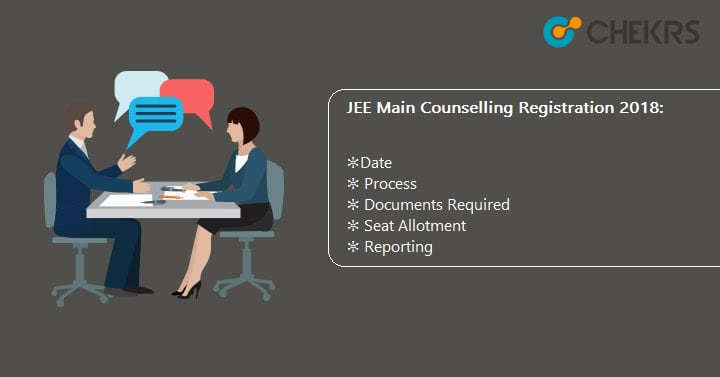 Joint Seat Allocation Authority (JoSAA) regulates the counselling process of JEE main. Here we are providing the information related to JEE Main Seat Allotment; go through the details shared in this article. JoSAA has announced the official date of JEE Main 2018 counselling. Check the list given below for JEE Main Counselling Dates. Enter JEE Main Roll no & Password and click on the Login button. Fill the required details. Click on submit button. It will ask for confirming registration. Click on Confirm Registration. Candidates have to fill the choice form to choose the college or course. Select Institute name & Course/stream. Fill a maximum number of choice for seat allotment. To arrange the choice in decreasing order. Select the option ‘Choice Rearrange’. Click on the lock choice option to lock the choices. Once choices are locked, can’t be changed. So select the choices carefully. Seat will be allotted to candidates on the basis of Seat availability, choice filling, and reservation criteria. Students will be called for document verification & seat confirmation through SMS or Mail. After the release of seat allotment list. Candidates have to report at the counseling venue along with seat allotment letter. Candidates have to report at the allotted colleges with original documents for verification. Pay the fee for seat confirmation and get fee receipt. The fee will be Rs.15000/- for SC/ ST/ PwD and for others, it will be Rs.35000/-. After confirming the seat, admission letter will be issued. Candidates can withdraw their seat. For seat withdrawal, candidates have to report at the allotted college. Students can’t withdraw their seat after 6 round of seat allotment. Freeze: Candidates who accepted the allotted seat and want to take admission in that particular institute. Float: Candidates who accepted the allotted seat but want to take part in further counselling round for better institution. Slide: Candidates who accepted the allotted seat but want other courses in the same institute. They can get chance to take part in another counselling round. Candidates who choose slide/ float option, they have to report at the allotted college. Slide and float options are given to candidates only, who have not offered to get admission in their first priority. No change will be made after seat allocation round 6. Tags:JEE Main 2018 Counselling, JEE Main 3rd Round Seat Allotment, JEE Main Choice Filling and Locking, JEE Main Counselling Process, JEE Main Counselling Registration, jeemain.nic.in.